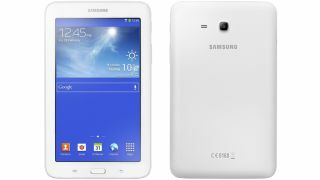 Just this morning we reported on the leaked user manual for the Samsung Galaxy Tab 3 Lite, all but confirming its existence. Now Samsung has made it official in a press release. We thought that Samsung may hold out until MWC 2014 to announce its new tablets, but clearly the Korean firm has other ideas. The new tab is aiming for the low end of the market with its 7-inch 1024 x 600 screen, 1.2 GHz dual-core processor, 1GB of RAM, 2MP camera and just 8GB of built in storage. However it does include a micro SD card slot. The slate is shipping with Android 4.2 Jelly Bean, has a 3600 mAh battery and comes in white and black. It's not the most exciting prospect ever but if the price is right it could make waves in the low end of the market. We got a suggestion of what the price might be earlier today, as the tablet was accidentally put up for pre-order at the same time as the manual leaked and the Wi-Fi version carried a price of $165 (around £100), while the 3G version was up for $263 (roughly £160). If those prices hold true then it really will be around the bottom of the heap price wise, but even then it will face some stiff competition from the likes of the Tesco Hudl. There's no word yet on a release date, but the press release states that it will be offered globally, so we'd expect to see it soon. For a more impressive Samsung tablet check out the Galaxy Note 10.1 (2014).